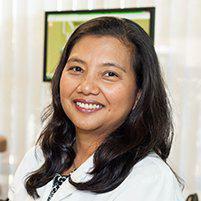 Dr. Elvie Nathanson, a board certified dentist located in Chula Vista, California, utilizes the most advanced, computer-aided technology to install crowns and bridges in just one visit. Patients across Chula Vista and neighboring National City come to Gentle Care Family Dentistry for Dr. Nathanson’s superior and convenient one-day crown and bridges. Crowns are permanent dental prosthetics used to protect and/or repair teeth that have become decayed or damaged. This includes teeth that are cracked, stained, broken or chipped. Crowns are secured to a patient’s existing teeth with a durable bonding adhesive. Crowns that are made of porcelain are extremely natural-looking and can be tinted to match the shade of the teeth next to it. A dental bridge is a custom-made prosthesis used to “bridge” a gap left by one or more missing teeth. A bridge is comprised of crowns — the visible portion made to look like teeth – on each side of the empty space, plus one or more false teeth in between. A bridge can be permanently cemented in, or removable. Removable bridges are held in place by connectors attached to the neighboring teeth on both sides. Bridges are most often made of either porcelain fused to metal or ceramic. Porcelain and ceramic crowns can be tinted to match the color of your natural teeth. Bridges are not purely cosmetic fixes, though. Unfilled gaps can cause a variety of oral health issues. Remaining teeth, for example, can shift to fill the empty space, causing teeth to become misaligned. At most dental practices, getting a bridge or crown requires at least two dental visits. At the first the tooth is prepared and an impression is taken from which the crown is sent out to a lab for fabrication. At the second, the crown or bridge is installed. However, Gentle Care Family Dentistry is among the select dental practices that offers state-of-the-art, one-visit restorations. Thanks to advanced technology called CEREC (Chairside Economical Restoration of Esthetic Ceramics), Dr. Nathanson creates and installs natural-looking, crowns and bridges during a single visit. The CEREC process uses computer-aided design (CAD) and computer-aided manufacturing (CAM) techniques to develop restoration that looks just like your own teeth, and to do it, onsite. There is no need to send off impressions to an outside lab. This approach is both more convenient and more economical. Not all restorations can be completed in one day, but many can. "You have got to try Dr. Nathanson. She is very gentle, caring, and very thorough. The only dentist I will go to!" "No waiting, I love that! This is what I have come to expect from Dr. Nathanson as I have been seeing her since 2006." “This is the best Dentist around. The office staff is very professional, caring and handles procedures that would have taken much longer with my past dentist. " “I recently went to Gentle Care Family Dentistry and had a Cerec crown down in one visit. It was amazing! I had no pain at all and felt very comfortable." "Dr. Nathanson is the best dentist I have ever had."